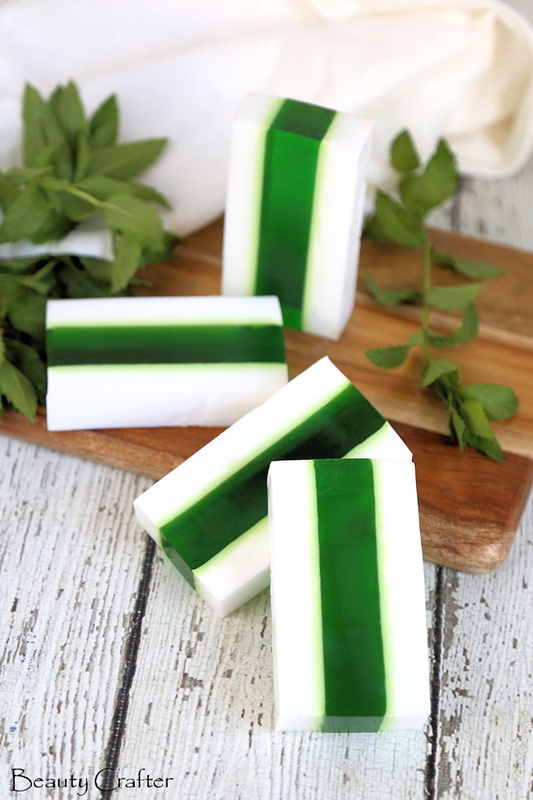 This Creamy Vanilla Mint Soap features a window like stripe of mint glycerin soap tinted green sandwiched between two layers of creamy vanilla soap. This refreshing, yet soothing combination is great anytime, but with the holidays coming up the white and green visual combination has added appeal. The stripe is created by pouring layers into a cube shaped silicone mold. 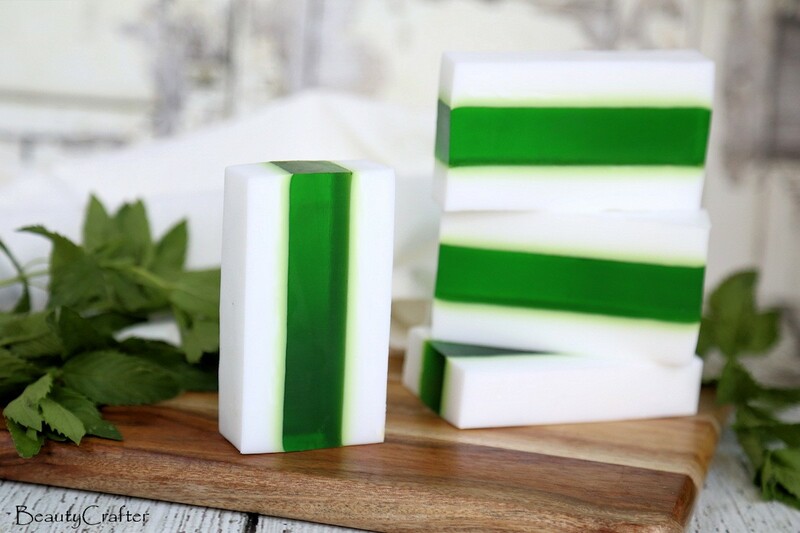 The mold easily releases the block of soap for slicing once cool. Full recipe with measures below. Ensure your silicone mold is free of debris such as lint. Ensure the soap is weighed and chopped up. Melt the half of the white soap base, by microwaving in glass mixing cup for 20 seconds, stir and repeat in 10 second intervals until soap is just melted. Add vanilla essential oil to the melted soap and gently stir, then carefully pour into the center of the mold to avoid drips. Leave to cool. Once the first layer is pretty firm, yet still warm, melt the clear soap (in intervals as above). Gently stir in the peppermint and colorant. Pour into the mold and allow to cool. Melt, scent and pour the other white layer and leave undisturbed until the cube of soap is fully cooled. Pop out of the mold, taking care not to bang up the edges. 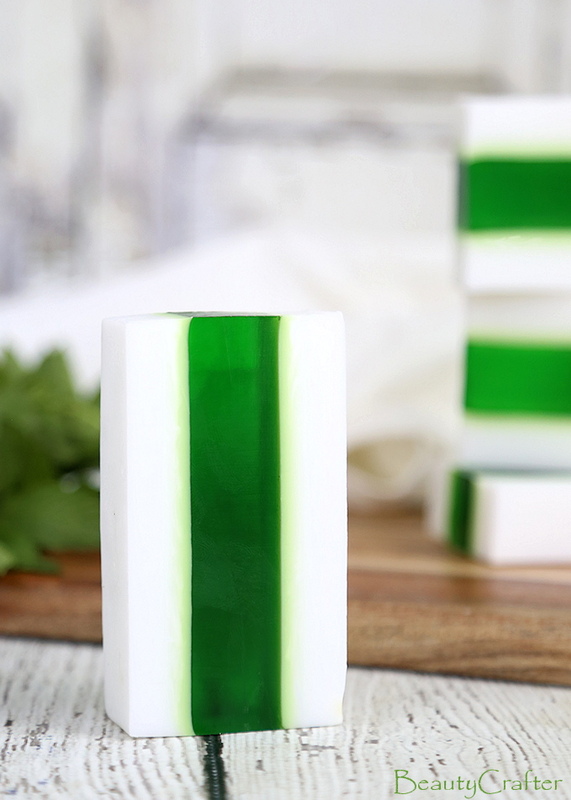 Slice the vanilla mint soap, then store in airtight container to help maintain fragrance. You may notice there has been some color bleed between the layers. This occurred over time, the soap was photographed roughly 2 weeks after I made it. For me the windowpane effect of the translucent soap between the creamy white opaque layers is well worth the loss of line crispness. The alternative is to use a non-bleeding colorant in the mint layer, but it is hard to obtain this level of translucy with mica based pigments.